Definitely you shouldn’t have said probably. 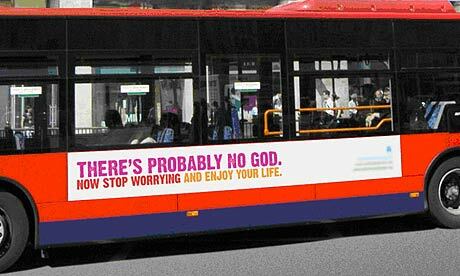 This Atheist billboard has garnered enough attention already. But as a copywriter, what irks me about this is the use of the word ‘probably‘. Atheist, by definition, know believe there is no god. And this organization has been backed by Richard Dawkins – the author of ‘The God Delusion’. In it he lays out, very angrily, a case for why all religions are bullocks. So why the hell would these geniuses say ‘There is probably no god’. The second line has absolutely nothing to with the first. People are happy/unhappy for a variety of reasons and no one, I know of, is worried sick if there is a medieval version of a superman sitting on top of the clouds. In fact, they are more worried about where to drink and how late the place remains open. So, Mr. Client From Hell, either say, ‘There is no god’ or stop wasting everyone’s time and money. Full Disclosure: I am definitely an Atheist. They must have spent zillions to get all these guys in one room. As for as celebrity endorsements go, this is funny. And I am pretty sure, sports blogs are going to have a field day, especially with Kobe and A-Rod. Does God allow these people to lose their soul every time there is an election? This priceless headline is from The Guardian. “I’ve kind of come to the conclusion that what passes for realism in movies has nothing to do with reality and that my stuff is more realistic than that. I’m interested in metaphors and dreams and being moved by those images and thoughts.” – Charlie Kaufman in a VF interview. Plus, he has read ‘The Catcher in the Rye’ 200 times! Awesome. As I was digging through my book collection, I came across Liars Handbook with a charming list of lies advertising agencies dabble once in a while. This list was collected in 1985 by The Sydney Morning Herald through reader submissions. And since there seems to a lie list for Creatives, Account Handlers and even Ad film directors…here goes agency lies. We are totally loyal to the client. This agency has never compromised creative standards and we’re not about to start now. We’ve never missed a deadline yet. It is a totally original concept. I’ve never even seen that copy of The Best of British Advertising. We always check the accuracy of the claims our clients ask us to make. We respect the intelligence of the consumer. Our ethical standards are the highest in the industry. We do a great deal of charity work which we prefer to keep confidential. We never do cigarette ads. That’s a special case, to do with long standing commitments too complicated to go into. We never take on a client if there’s any risk of conflict of interest. They’re not spelling mistakes, they are just typographical errors. The art director feels the apostrophe spoils the look of the headline. We conducted extensive and thorough research – we talked to a large number of consumers. The ad didn’t pull but it did a lot for the client’s image. Our audience ratings are down, but we all know about surveys, don’t we? We’re going to be late with the artwork, but wait until you see the treatment. Sure Andy’s a hopeless drunk, but he’s a brilliant creative director. They haven’t taken over our agency – we’ve merged. We didn’t sack Andrew, he resigned. This commercial cries out for atmosphere – we’ve got to shoot it in the Bahamas. UPDATE: Okay enough of beating ourselves all the time…can someone make a list of ‘client lies’? 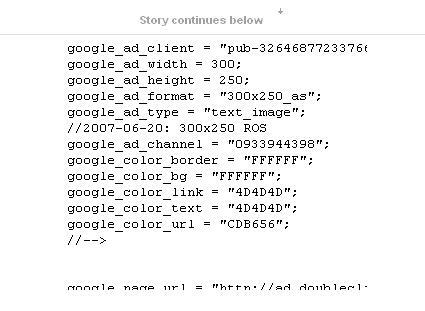 Ever wondered how bad a banner ad can be messed up, apart from the usual lack of creativity and the high annoyance factor? And not to mention, how ads appear magically before the page downloads…well, this time, it’s just hilarious. As far as symbolism goes, this is huge. 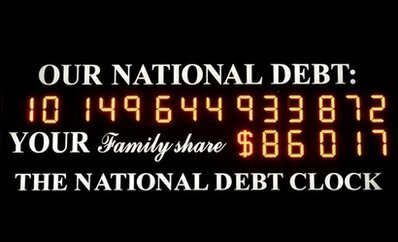 The National Debt Clock has been teasing the locals and scaring the tourists for a long time. And now it’s busted. Congrats, Wall Street! Related: A bank tries to laugh at the whole crisis.